It's been awhile since I've done a haul on this blog and it's been even longer since I have bought anything off HauteLook. At the beginning of May theBalm made another appearance on the site so I stocked up on a few items as well as grabbed some things from skyn ICELAND. In true HauteLook fashion my goodies are just coming to me now so I'm going to share the goods! I'm making it my personal mission to own everything from theBalm, I think it's safe to say at this point that it's my favorite overall brand because I think both their makeup and skincare are just so phenomenal. In fact Time Balm (the skincare line of theBalm) is slowly taking over my skincare routine, it does have a dominating presence in my morning routine which is something I will need to post an update about soon since I think I almost have the product line finalized! Anyways, on to the goods! First up are the two back-ups I picked up. My favorite kiwi facial scrub that I won't bore you with my raving, it's such a great deal when it's on HauteLook so I just had to pick it up. Last minute I was trying to push my cart over $100 for the free shipping so I added the Brow Pow into my cart. I still have plenty of this stuff left but it's a pretty solid product and a good color match for me so I decided to just go ahead and pick another one up. I went back and forth about whether or not I needed this but I decided to just complete the collection and pick up the last "-Lou Manizer" in the set. This one is more of a sparkly bronzer and that's why I hesitated to pick it up but I think I can also make it work as more of a subtle highlighter since the other two, Mary-Lou and Cindy-Lou, are both very light and glittery which doesn't always work with my skin tone. I have a teeny tiny sample of Swiss Dot that I got from Birchbox which is the most crazy pigmented blush I've ever tried so this time around I decided to pick up some colors from this line. Toile is a nice coral peach, Houndstooth is a gorgeous berry, and Argyle is the nice everyday light pink. I can't wait to use these because these colors stick to your face and are so beautifully pigmented you just need a little. 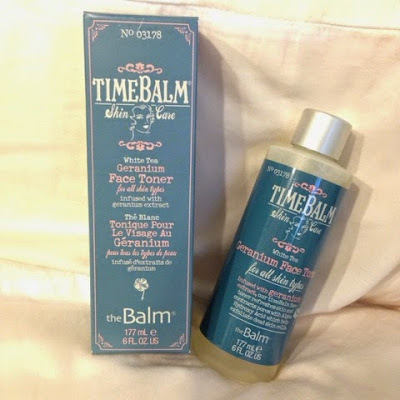 It's slim pickings over the remaining skincare items now for me so after much debate I settled on the Geranium face toner which seems like a good all around toner for all skin types. I've always heard great thing about these eye gels so when I saw that these two events were running simultaneously I had to go pick up these guys too. They are just gel patches that you place under your eyes and it helps to de-puff your eyes and firm the skin around it.These would be great for those days where I'm running late because I can stick them on for the drive to work and peel them off when I get there. And the anti-blemish gel, I finally ran out of spot treatment so I picked this up just to test how well it would work for me.